From authors Missy and Mia Robertson comes the fourth book in the Princess in Camo series—Finding Cabin Six. It’s summertime—and when you’re a Carroway, that means heading to camp for an exciting week of fun, friends, and faith-building. But this summer will be different—rumor has it that the camp is struggling and may be sold to a resort developer at the end of the season. Cousins Allie, Kendall, Lola, Ruby, and Hunter are devastated by the news, so they set out on a mission to save the camp! This fourth book in the Faithgirlz Princess in Camo series is the perfect addition to this unique storyline about a fun and faith-filled family in a world of class and camouflage. 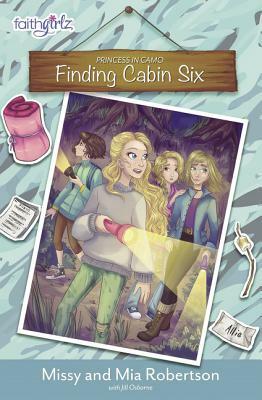 Finding Cabin Six by Missy Robertson;Mia Robertson was published by Zonderkidz in September 2018 and is our 50315th best seller. The ISBN for Finding Cabin Six is 9780310762546. Be the first to review Finding Cabin Six! Got a question? No problem! Just click here to ask us about Finding Cabin Six.